MONITOR YOUR REPTILE\'S HABITAT WITH SUBMERSIBLE ANALOG GAUGE --- SunGrow Boro Analog Dual Thermometer and Humidity Gauge allows you to monitor your terrarium habitat precisely. Being a reptile hobbyist, it is essential that you provide them with the same living conditions indoors which they have in their natural surroundings. This gauge ensures that and thus ensures a long and healthy life of your animals. 99.99% TEMPERATURE AND HUMIDITY LEVEL ACCURACY --- Unlike other cheaper options available in the market, SunGrow Boro Analog Dual Thermometer & Humidity Gauge guarantees to provide you with 99.99% precision. STAND & SUPER LIGHT-IN-WEIGHT ENABLES EASY RELOCATION & CLEANING --- The analog dual thermometer and humidity gauge by SunGrow is very lightweight (only 1 lbs) and easy to use. For user\'s convenience, it comes with a stand. You can remove and place it as per your convenience during tank cleaning or relocation. 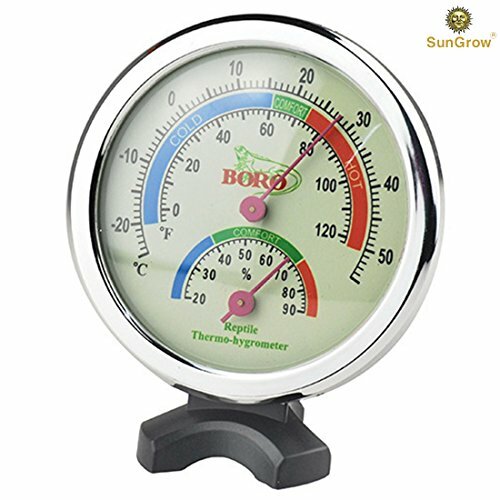 IDEAL FOR INDOOR & OUTDOOR USE --- Whether you want to use it indoor or outdoor, the 3 inches SunGrow Boro Analog Gauge work accurately in all situations. FEATURES A LUMINOUS FUNCTION ENABLING NIGHT VISIBILITY --- Now, night monitoring of the terrarium has become so easy. You don\'t even need to use the phone light to note the readings in the thermometer. This state-of-the-art hygrometer consists of night visibility for the terrarium. Please note, to activate the luminosity, you need to charge it by switching a bulb or similar light source next to it for 4-5 hours. Then only the night light will be charged and light up in the night for a few hours.